Final exams are fast approaching, and hundreds of students in the College soon will be heading home for winter break. But not everyone. Nearly 600 students stayed on campus during winter break last year, and school officials expect that number to increase. Residence halls close for the semester at 9 a.m. on Saturday, December 22. Eligible students who register to remain on campus will be part of Winter Stay, which runs from December 21 to January 12. Housing is available in Susan B. Anthony Halls, Genesee Hall, Riverview, Brooks Crossing, Southside, and the Maisonettes. Why is Winter Stay important? 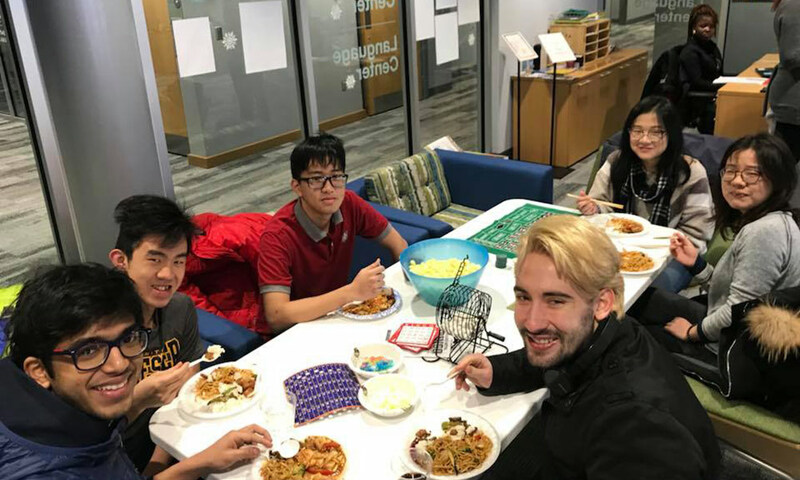 The break period is a time for students to rest and recharge for the coming semester and we want to ensure that those who remain here for the break continue to feel welcome in their “Rochester home.” We are increasingly moving toward being a 12-month campus and consider Winter Stay an important continuation of how we support students throughout the year—with food, housing, activities, and other resources. For those wishing to utilize Residential Life housing, students must be a current undergraduate students who have a spring 2019 semester housing contract. Events, activities and other services are open to all undergraduates regardless of whether they are living on or off-campus during the break. Will resident advisors be on duty? We will have limited RAs, and Residential Life staff on call. Is there any additional cost to eligible students? What do they need to do—and when? Students must register through the residential life website by December 17 for housing. Only a select number of residential halls are open. If yours isn’t and you want to stay in a friend’s room in one of the open halls, you need to have your friend submit a registration form on your behalf. Residential Life will follow up with all parties to ensure everyone has a place to stay prior to break. How do students pay for their meals? Swipes stop at the end of the semester, but fall declining dollars are valid through January 10. You also can use them at Café 601 at the Medical Center, which is helpful on weekends because the River Campus dining halls are closed at that time. Students can budget their meal plan dollars by using the DB Budgeting Calendar. Dining schedules are available on the Rochester Dining website. What’s provided, and what isn’t? Housing is provided for all eligible students. Dining halls are open and available for all students, faculty and staff. Winter Stay events are open to all students. University libraries and the Goergen Athletic Center are open but have limited hours. Students can find a full list of building hours online. Will bus lines be open? Reduced shuttle service to the River Campus will begin on December 24th and end on January 12th. Shuttle schedules can be found on Transportation’s website. Where can students find a list of events over Winter Stay? All of the events can be found at rochester.edu/winter, including University sporting events and events happening around the community. What’s the Winter Share Student Pantry? The pantry is designed to meet the immediate needs of Rochester students by providing non-perishable items, basic necessities, and winter apparel. It will be located in Gates 1, Room 166 on the first floor of Susan B. Anthony Halls. Students must show a University ID to access the pantry, but the service is completely confidential. Students can go online for pantry hours and more information. What else should students know? We’re piloting a student support basic needs hub to facilitate the connection of campus and community resources for students in need. This includes food, housing and wellness security. While the pantry is a great place to start, if students need additional assistance, we encourage them to take advantage of this resource. Students who want to receive more information and updates on Winter Stay should sign-up for the Winter Stay newsletter.